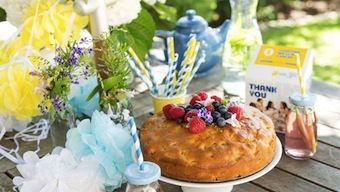 Host a morning tea in May or June to help the Cancer Council raise funds for cancer research, prevention, and support. It's easy to do; simply follow these five easy steps! You will receive a host pack filled with everything you need including ideas, tips, and promotional materials, such as posters, stickers, and a donation box to use at your event. Personalise your own fundraising page on the Cancer Council website, with the details of your morning tea. Then invite your friends via e-mail or social media to donate and attend your event! Set a date and location, get creative with theming, decorating, activity, and recipe ideas, then start fundraising! The official date for Australia's Biggest Morning Tea 2015 is Thursday 28th May, but you can hold your event any time during May or June. Bank your funds by 1st July 2015 to go in a the running to win a fantastic prize valued at over $1,300. Details here. If you can't host a morning tea, you can directly donate to the Cancer Council at any time.